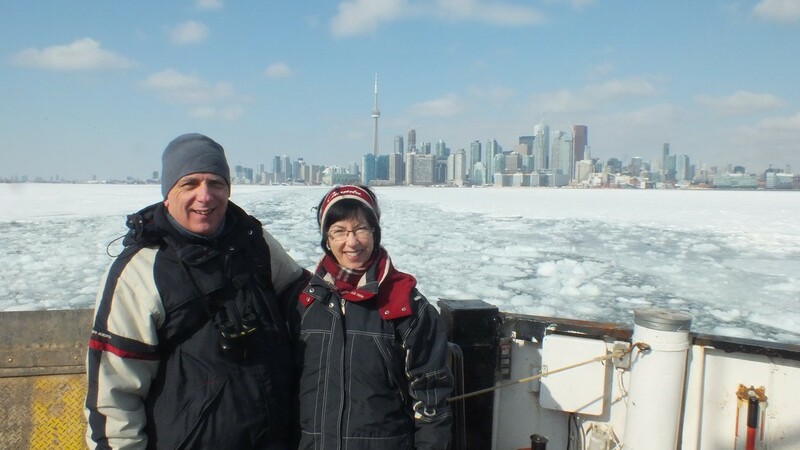 One winter, Bob and I decided to make a trip to Ward’s Island aboard a Toronto Island Ferry in Toronto Harbour. It is one of 13 in the chain of islands that gives protection to Toronto’s Inner Harbour. 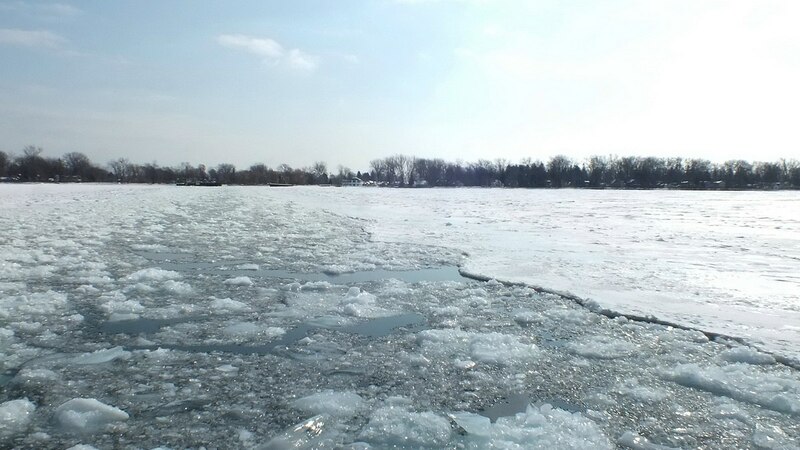 With the winter of 2014 being the longest and coldest in recent memory, the bay separating the mainland from the islands had become totally frozen over. 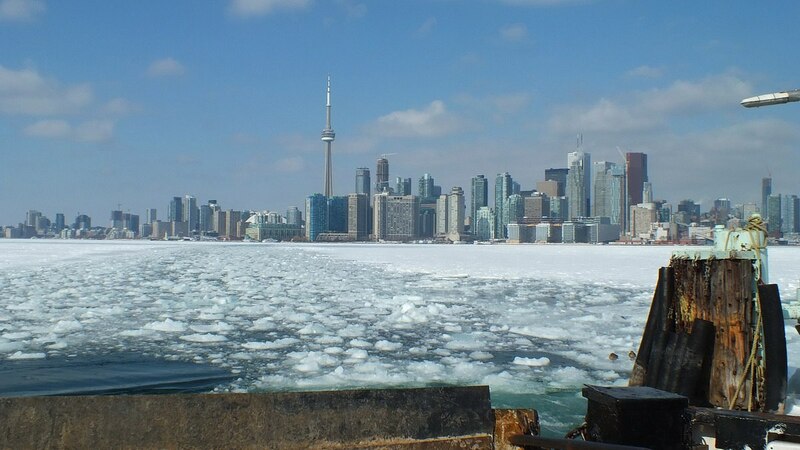 We thought it would be a neat experience on board the ferry as it negotiated the icy waters on its way to Ward’s Island. It was a pristine day, sunny but cold, windy with a clear sky, as we set off from the Jack Layton Ferry Terminal at Queen’s Quay West and Bay Street. 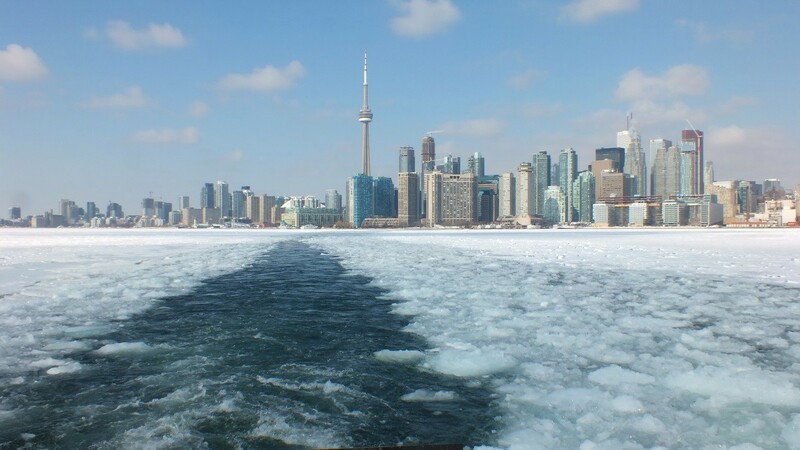 The Toronto Island Ferry had just returned from an earlier crossing to Ward’s Island, so the channel through the frozen harbour lay filled with loose masses of ice. It is thanks to a Toronto fire boat that the channel between mainland and the island is kept open. 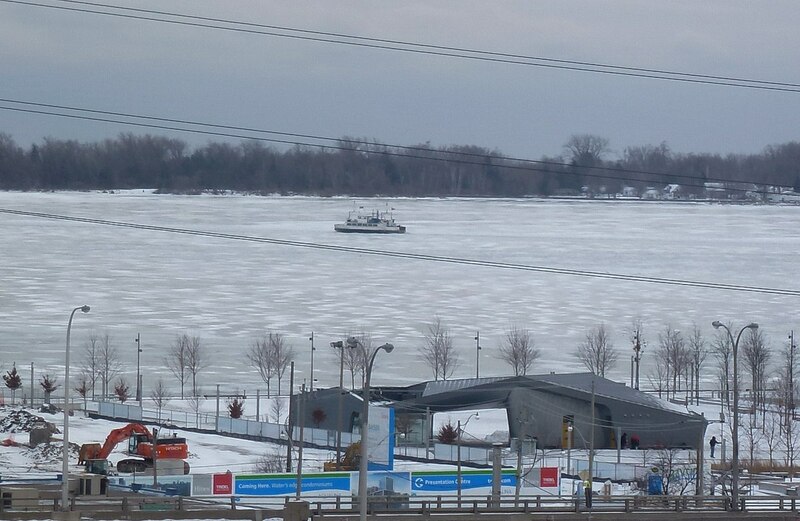 The William Lyon Mackenzie doubles as an ice breaker and is employed to keep water lanes open so that the fire boat can respond to emergencies on the Toronto islands. The benefit of that endeavour is that the open lanes of water provide a means for the ferryboats to service the islands as well. Viewing the city skyline from the northeast shore of Ward’s Island, which in actual fact is not a separate island at all but only the easternmost end of Centre Island, really impressed upon us the degree to which the Inner Harbour had frozen over. It was one solid mass the likes of which we had never seen in all our 39 years of living in Toronto. 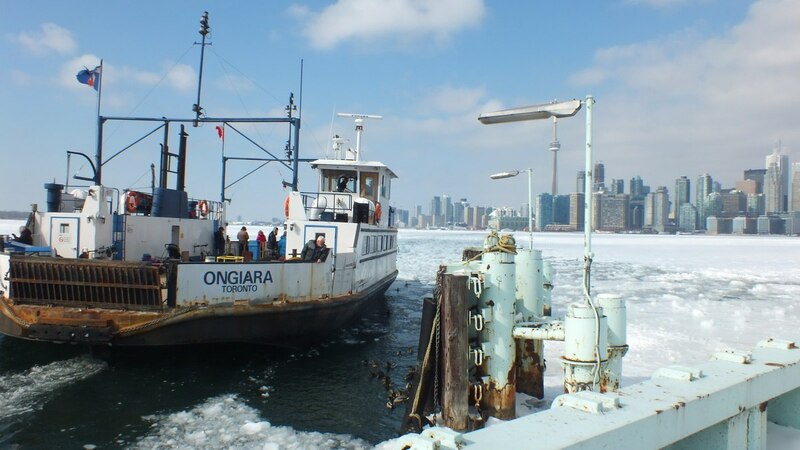 Here, we see Ongiara, one of the Toronto Island ferryboats, forging its way through the thick layer of ice towards Ward’s Island. During the winter months, the city ferries operate on a reduced schedule due to the harbour conditions and lack of demand to get to the islands. Having said that, the service to Ward’s Island continues year round because the full-time residents on Ward’s and Algonquin Islands depend on it to get to work, school, shopping and entertainment. 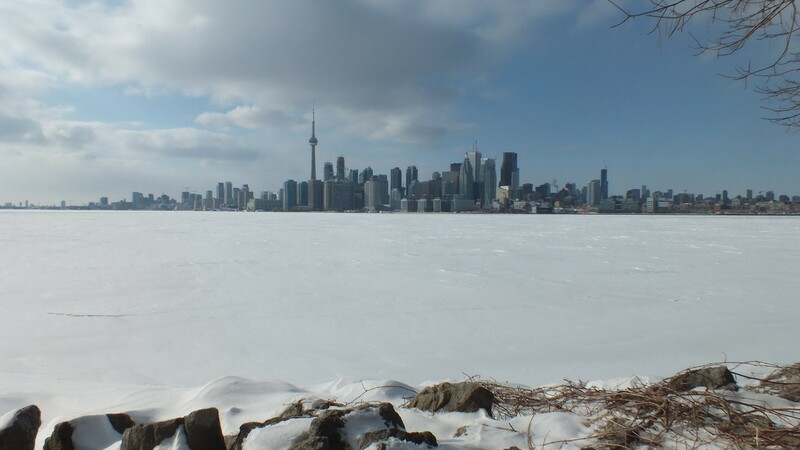 It was quite a different view of Toronto looking back across the frozen expanse. We had only made the trip in winter once before, and that was probably about ten years earlier. A summertime passage when the waters are warm and calm appeals to more people, but Bob and I found it invigorating to be out and about enjoying the uniqueness of the islands in winter. As the ferryboat progressed further from shore, humongous sheets of ice could be seen where the vessel had already pushed them aside. 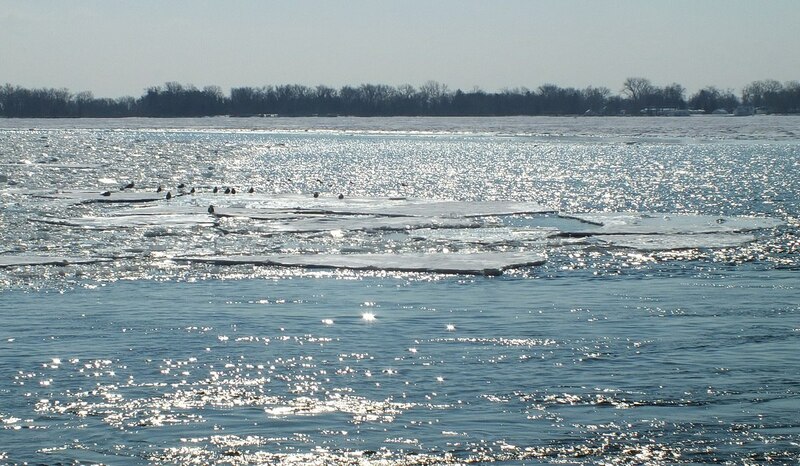 The morning sunshine literally glittered off the frigid water and solid surface of the bay. 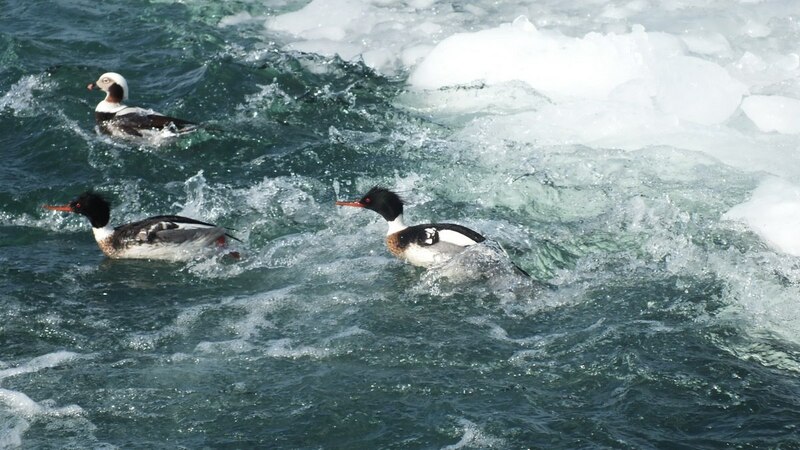 Because the winter of 2014 was so bitter, waterfowl struggled to find open water all across southern Ontario. The continuous use of the ferry lanes in Toronto Harbour provided one dependable source for birds such as this Long-tailed Duck. Even it seemed to be basking in the welcome sunshine there on the lip of the ice. 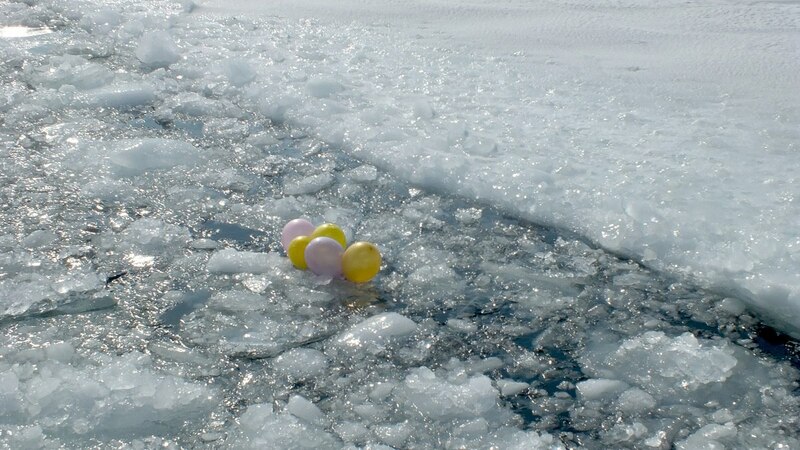 I would imagine being a duck there amongst the huge globs of ice would be quite treacherous. 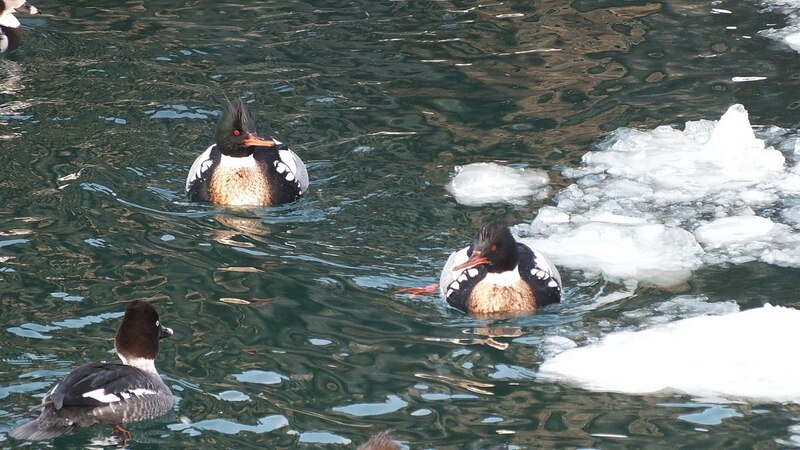 Here, we see two Red-breasted Mergansers quite oblivious to the predicament that could ensue should the ice suddenly be forcefully pushed aside by the movement of the ferry. 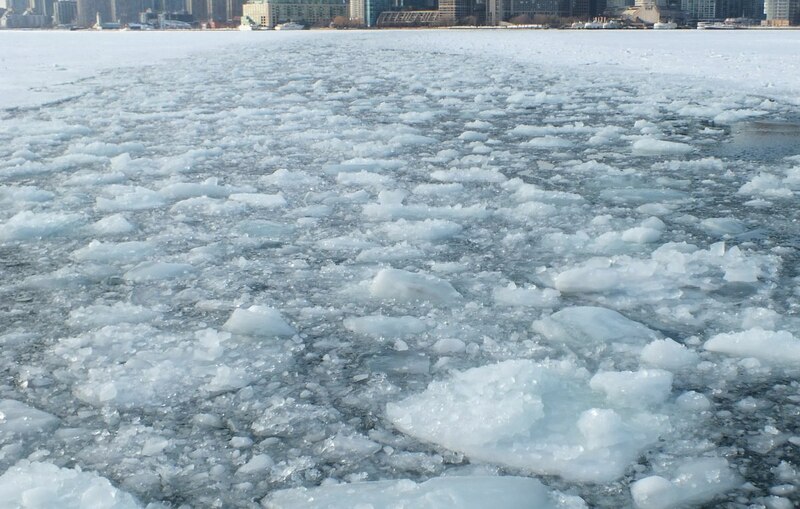 It was quite exhilarating as we progressed across the icy channel to listen to the ice cracking and snapping under the force of the ferry’s momentum. 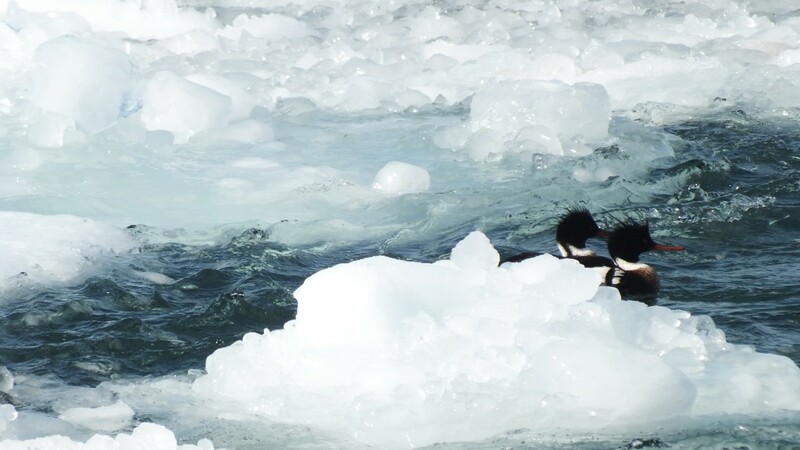 By times, as we stood at the bow of the boat, chunks of ice would come flying up into the air towards us. The ice coalesced quickly into a dense mass, so when it came into contact with the steel hull, the noise was deafening. 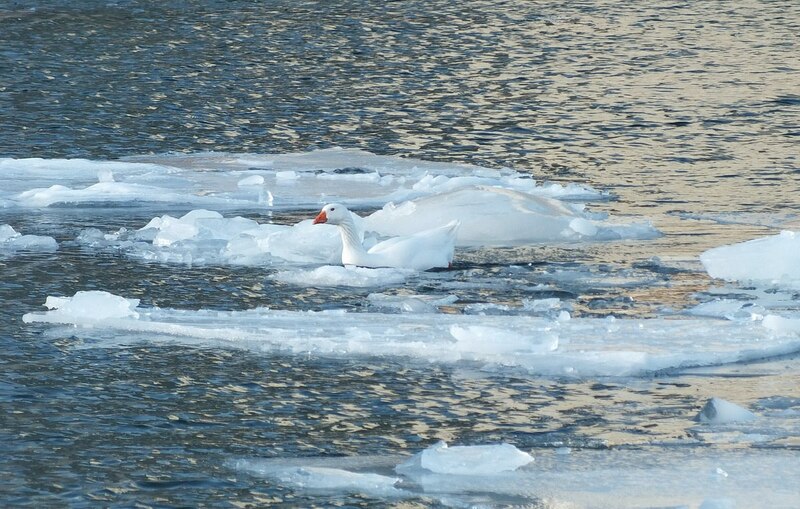 What a huge surprise, as we gazed out over the water, to spot a lone Snow Goose floating beside some of the ice floes. It blended in so well that I could hardly pick it out even though Bob drew my attention to its whereabouts. It seemed quite the aberration to find a Snow Goose here in Ontario…on Lake Ontario…quite the opposite situation to where we had last seen hundreds of them near Vancouver, British Columbia a mere two months earlier. Given the consistency of the water there in the bay, so jammed with slush and slabs of ice, I wonder that any of the waterfowl could find it inviting. With the wind and current, there was constant ebbing and flowing. It was a real trick for the ferryboat to pull up to the pier on Ward’s Island. 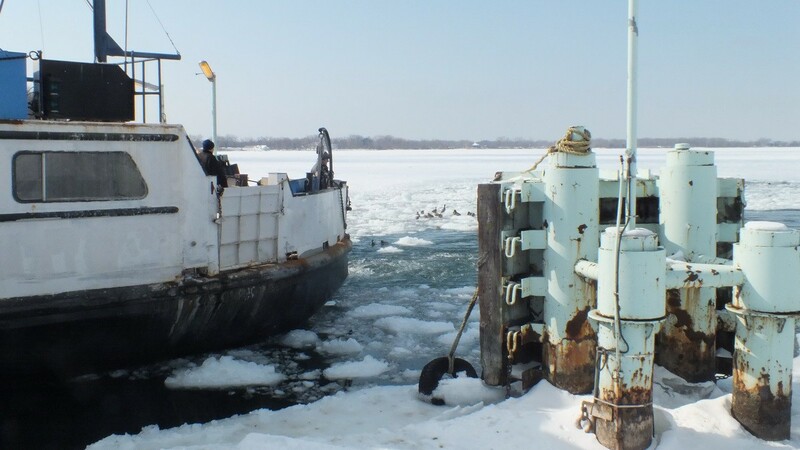 The forward motion of the vessel moved tons of ice into the slot where the boat had to dock. Complicating the matter was the flocks of ducks that were taking advantage of the open water adjacent to the wharf. My goodness, the ducks had to tolerate the horrendous turbulence caused by the surging water and manage to not get trapped by the shifting ice. 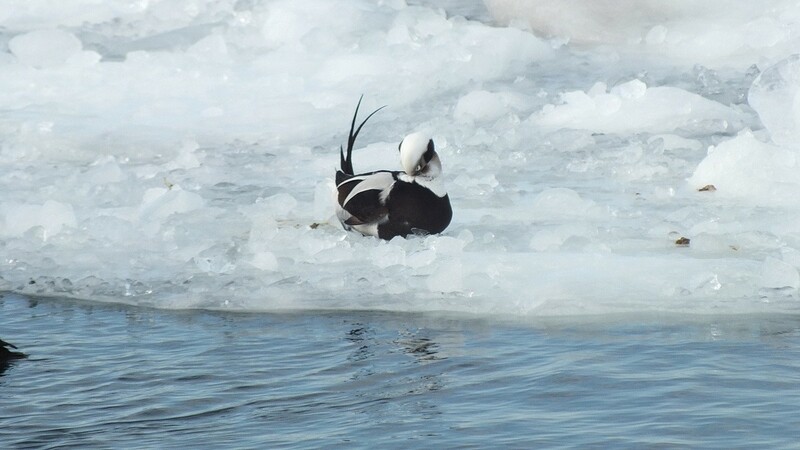 After Bob and I disembarked with a handful of other passengers, residents and visitors alike, we spent some time photographing the variety of ducks that clung to the edges of the ice and dipped below the icy surface. A few moments later, the ferryboat set off on its return trip to the mainland. It would carry out multiple trips across the bay before the end of the day. The wind sweeping in from the east across the frozen harbour was brisk that day, and as we watched the ferry move away from us, the gusts quickly had the pieces of ice melding together into a compact ice floe once again. The demand for any traces of ice-free water was high. 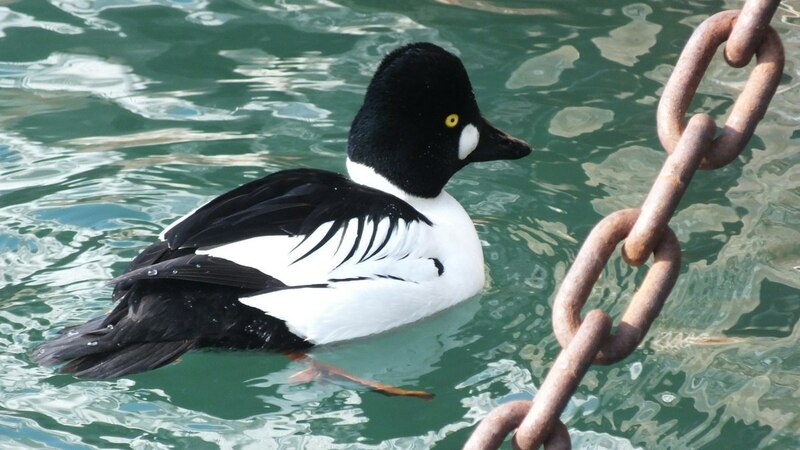 This Common Goldeneye managed to score a calm spot right below the pier. Bob and I had a blast observing the antics of all the ducks, and were pleased to find so many species in one spot. 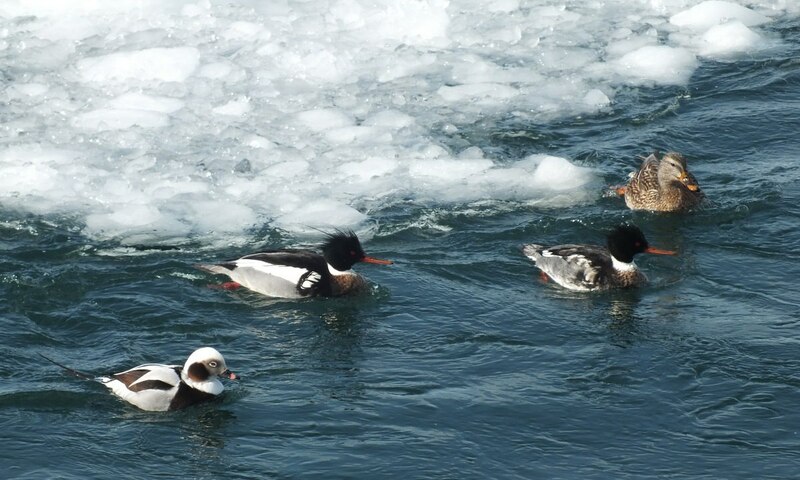 These Red-breasted Mergansers seemed quite at home. For us, the limited availability of open water definitely was a benefit. While we looked on, all of the ducks were actively diving for food, dipping under the ice, preening and enjoying the chance for a swim. 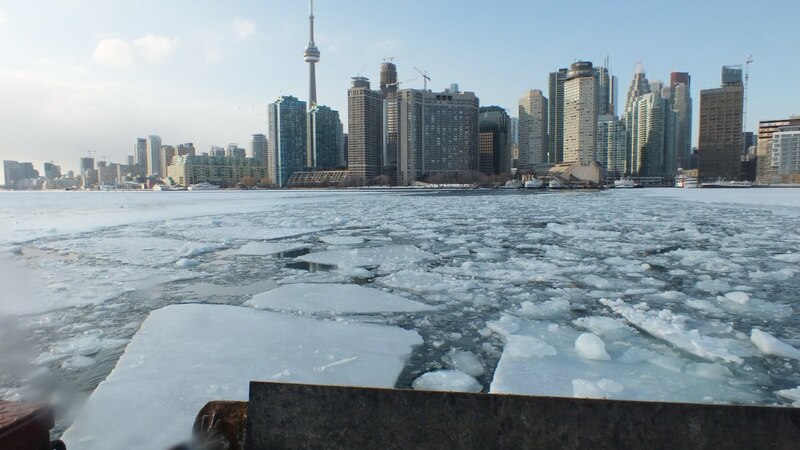 With the Arctic vortex gripping Toronto for countless weeks, the water in the Inner Harbour developed a thick layer of ice necessitating daily trips by the ice breaker for days on end. In fact, the ice breaker expected to surpass the record set in 2001-02 for consecutive daily trips. 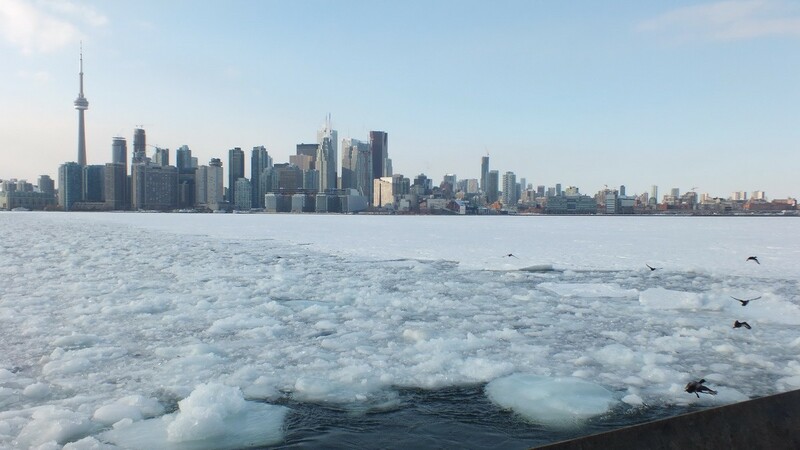 As of the past Tuesday, William Lyon Mackenzie made its 79th consecutive daily ice-breaking mission across Toronto Harbour. Wish I could have been aboard that vessel!